I wanted to be a Director for the largest student-run philanthropy in the world to inspire our volunteer base to become strong philanthropic leaders, spread awareness of childhood cancer all across the corners of the world, and provide emotional and financial support to the families we interact with every day so that in the future no parent will have to hear the words, “Your child has cancer.” I recognize that this organization’s success starts with the leaders who are placed in these positions. My passion and dedication for this organization stretches far beyond the THON and Penn State communities and I am excited to bring THON to new heights in 2019 and beyond. 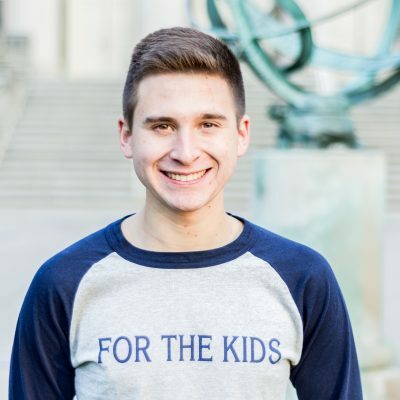 What are your main duties as the Supply Logistics Director for THON 2019? My main duties as Supply Logistics Director include overseeing all in-kind (non-monetary) donations for pre-THON events and THON Weekend. I work with several donors ranging from local companies such as ProCopy and Penn State Multimedia Print Center to large corporations including Nike and Dell. All of whom are dedicated to continuing THON's mission every day. In 2018 the Supply Logistics Committee was able to cut down on over $100,000 of expenses through in-kind donations. As the Supply Logistics Director, I am also responsible for all of THON's printing needs. This includes printing projects like donation box labels, the corporate packet, and the logo banner displayed above the stage during THON Weekend. I also lead a committee of 20 devoted captains who are working to acquire in-kind donations and manage THON's vast supply inventory system. My favorite THON memory was last year when my Co-Captain and I traveled to Penn State Children's Hospital to deliver all the toys that had been collected from the Hershey Holiday Toy Drive. Although we did not get to see any kids while we were there, the look on the Child Life Specialist faces when we opened the trunk of the car is something I will never forget. They were so overwhelmed by the vast amount of brand new toys that had been donated and continued to thank all of the Penn State students and alumni who made it possible.